For the last ten years, design leaders, professionals, and students have converged in different international cities for IxDA. This February at the Interaction17 Education Summit, New York City, Molly Steenson and I collaborated on a workshop called “Teaching & Learning Disruptive New Mediums – AR, VR, AI, and IoT.” The workshop produced a lively discussion on defining the mediums and exploring how designers can learn and participate in the future directions of new technologies. After the presentation section, we had 40 some participants (which included design faculty, designers, industry representatives and students) form groups and design an AI project in 45 minutes. The project, called Useless AI, was designed to take a critical look at artificial intelligence and serve as a model for how designers can approach a new medium. Rather than fall into cliches of what AI might be, designers are challenged to critically look at the medium and imagine how an interesting idea could go all wrong. In this way, we can develop a deeper understanding of the beneficial and problematic affordances and potentials of a new medium, and ultimately develop more powerful ideas informed by taking risks and understanding the interesting failure points. 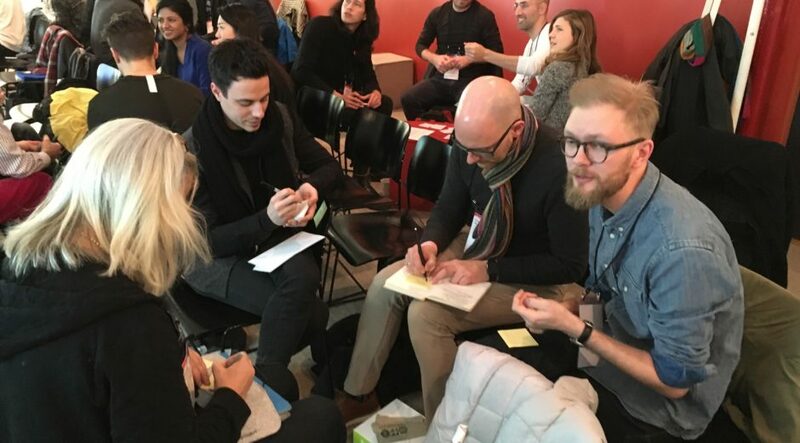 As a further way to advance the teaching and learning of disruptive new mediums, the workshop participants agreed to form a new network of designers working in this area. This will create a peer-to-peer group that will share approaches, insights, examples, and coursework to address AI/ML/IoT/AR/VR. In addition, I was able to touch base with several MDP alumni at the conference including Jisu Choi (Intel), John Ryan (Local Projects), Xiangjun (Shixie) Shi Trofimov (IBM) who are all working in these areas. We hope to extend this new network to these and other alumni. Molly and I will continue this collaboration at an upcoming symposium on Artificial Intelligence called Design the UX of Machine Learning Systems, March 27-29 at Stanford University.